Are your employees happy in their jobs? That a big question – but it’s an important one. 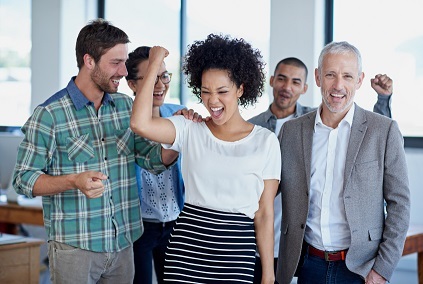 Workplace happiness may seem a fairly subjective topic, but what isn’t subjective is what happens when your employees enjoy their roles and enjoy their office. Happy workers are better workers – they’re more loyal, they’re willing to work for less, and they’re more productive. Sure, salary is one thing, but true job happiness actually comes in other forms – and if you think your staff is happy, think again. Statistically, they’re probably not. So, one thing that’s worth doing is monitoring the tone and vibe of your office regularly – waiting 12 months to have an employee review is too long, said Trey Taylor, chief executive at Taylor Insurance Services consultancy. “The annual survey is R.I.P. It’s simply too late. The guy who you’re trying to understand, his motivation to be with the firm or not, he’s already left the firm by the time his annual survey comes around,” he said. Instead, Taylor has employed a service that tracks employee happiness on a biweekly basis, anonymously online. In a practical sense, that has meant making some pretty serious structural changes, including a no-vacation-time policy for salaried staff (meaning, in a simplified sense, they can vacation whenever they like, so long as they have the free time to do it); and for commission-based sales staff, who may be reluctant to take holidays because it means not earning money, the company is trialing paying for a percentage of their vacations, to encourage a healthier work-life balance. These methods, of course, will not work for every organization. But everyone should be looking into increasing workplace harmony, if they want to get the best out of their staff. According to a 2017 employee engagement report by TINYpulse, entitled “The Broken Bridges of the Workplace”, there are some startling corporate trends that make employees unhappy. The study found that “invisible culture”, such as interpersonal relationships and work environment, makes workers happy, while, surprisingly, benefits and flexible schedules didn’t have a major impact. It’s not just money that workers want. They desire appreciation and positivity. So, how can you gauge your workers’ contentment? Online, there are websites on which employees can grade their workplaces and bosses. One such site is GlassDoor, where employees (past and present) rank their company and boss out of five stars. On it, for example, Allstate has a 3.4 rating from 3,500 reviews. Of those reviewers, 61% would recommend the company to a friend, and 74% approve of the CEO. Arthur J. Gallagher has a 3.2 rating, with a 54% recommend rank, and a 79% approval of Pat Gallagher as CEO. Aon has a 3.4 rating, with a 66% recommendation and an 84% approval rating for CEO Greg Case. But online reviews are charged – like Yelp and elsewhere, disgruntled folk may go online anonymously to air their grievances. The reviews can be useful to get a sense of a company’s culture, if nothing else. From a real world boss, though, what makes a company successful and keeps employees happy? There are many different answers, opinions will differ, and there may be no such thing as a magic recipe. We asked Andrew Horton, global CEO of Beazley, a specialty insurer with underwriting and claims teams around the world, what keeps his staff happy. “Let them do what you’ve employed them to do,” Horton said. “You empower them. Most people like the fact that you are entrusted, you’re empowered, and you can just get on with it, rather than having things signed off in triplicate or going to committees, where every single decision you worry about someone else questioning whether your decision is right.